H.264 Video Compression maximizes the hard drive recording time (Extra Hard Drive Required), as well as transfer video for viewing over the internet. Using cutting-edge H.264 compression. The footage records in real time so that when you play your footage back, it streams flawlessly and ensures that you never miss a thing. Built-in USB port gives you the option of rapid backup and transferring your video footage with a USB flash drive or external USB hard drive. Base on LAN or Internet Browsing remote access. Monitor and manage your home or office 24/7 from anywhere around the world via the internet. Enjoy additional peace of mind by receiving instant email alerts when motion is detected, when the hard drive is full, or when and if video loss has occurred. Important: System does NOT include Hard Drive. The Kare is ideal for both your home or business. This Waterproof 960p 1.3 mega pixels resolution provides amazing picture quality. It is suitable for flexible internal or external use with 3.6mm fixed lens wide angle view as well as long viewing distance. It is viewable in full color with an impressive night vision range of up to 15-20m. The system includes the very latest P2P 1080p HDMI DVR allowing easy access to the internet through mobile phones, tablets or PC¡¯s with the free apps provided. 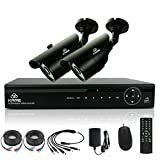 The system is supplied with everything that is needed to set up your CCTV system, complete with all cables, connectors, leads, power supplies and instructions.